Lately we've been making Ina's Country French Omelet on the weekends. So easy and so delish! I highly recommend making it and getting creative with the ingredients. Once we came out of our breakfast coma, we took Stella to the public library for the first time. My little bookworm was in heaven! We vowed to make the library trips a weekend tradition and have even made a special place in the house to keep them so they don't get mixed up with her own books. 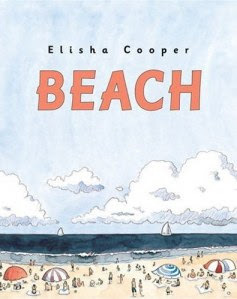 While there, I fell in love with Elisha Cooper's book, Beach. You've most likely seen one of his books before but this one in particular I must buy. We watched our friend's daughter, Blake, who knows how to use an iPad so well it's scary. She's only 1 1/2. Too young or the wave of the future? Curious to know your thoughts. I think it's quite wonderful in moderation. Stella then showed her how to have a proper tea party. Today we hit up Good 2 Go Taco, which you have to try if you live in Dallas. Just don't go hungry because there is a line - but it's worth the wait! Our fav was the taco called Paris, TX: grilled hanger steak, eggs, spinach, potatoes, and charrca tomato hollandaise. I pretty much love anything with hollandaise on it! Stella just stuck with a tortilla filled with cheese. Lastly, while Jeff watched football, I whipped up some smushy pillows for Stella's room using a Pierre Deux tiny floral and a Cowtan & Tout stripe. These are amateur at best since I'm learning how to sew. Sounds like you had a nice family weekend. Oh I admire people who can sew!!! I've tried to learn several times and it just does not come easily to me. Not sure how I feel about the ipad?!?! I cannot imagine my 18 month old being able to manipulate one but I wouldn't put it past him for sure. I guess I'm more of a fan of old fashioned playtime. However, I have allowed my older son (4.5) to begin using my computer for some games and things as I know they use them in the kindergarden classrooms. Either way, they sure are exposed to much more technology then we ever were and that's probably something we cannot avoid. Glad you enjoyed your weekend!! I am going to try Ina's country omelet...sounds so good...gotta love Ina. I think the ipad thing is crazy!! The library visit sounds so sweetly quaint in comparison. Yes, my girlies had so much fun on their first NYC visit. I used to be based there when I was a flight attendant for American Airlines - but I was always flying in to stay at my commuter apartment and then flying home after a trip. I saw NY of course, but missed so much. Shake Shack was great because you are sitting outside with all of the trees and flowers around you. A really magical little place in the city. I might need some advice from you the next time I know we are headed down!!! Wow! You really have good weekends! Your daughter is just adorable.... I love that she's so into reading. That's awesome!